(NewsUSA) - We live in a digital world that is constantly evolving. Those of us who were born prior to the dot-com bubble were able to witness firsthand how technology transformed the way we lived our day-to-day lives. Then, in the early 2000s, the rise of social media forever changed how we interact with one another. Entire industries were forced to adapt to this new era. There is one industry that is still in the early days of its evolution: the news industry. A recent poll by the American Press Institute revealed that 85 percent of millennials say keeping up with the news is important to them. With growing millennial interest and the recent increase in digital news consumption, it's no surprise that some of the biggest social media companies are trying to break into the news industry. This new frontier of digital media has companies like Facebook, Snapchat and Twitter racing to apply the news to their existing platforms. The truth is, the news needs a platform of its own. Enter Rantt, the social network for news. This startup aims to inform and inspire the masses. Zak Ali, co-founder and CEO, believes the recent surge of people engaging with the news online has created a new genre: social news. "When you read a story that truly impacts you, one that you can't ignore, you feel the need to interact with it," he said. Backing Ali's assertion is a Pew Research poll that found 46 percent of people active on social networks have discussed a news-related issue or event. The problem, Ali said, is that the scattered nature of the Internet forces people to navigate among many different sources to read credible news stories and to share their opinions. "Too often will you see really well thought-out posts buried beneath a mountain of unrelated content. Your voice matters. You shouldn't feel like a bystander while reading the news. On Rantt, you don't have to," Ali said. Rantt delivers the latest news from top news sources. By tailoring the feed to your interests, Rantt aims to provide only the content that's important to you. Not only can you discover news stories, you are encouraged to speak about them and publish pieces of your own. "With Rantt," Ali said, "you aren't just reading the news...you are becoming a part of it." For more information, visit www.rantt.com to download the app from the Apple App Store. 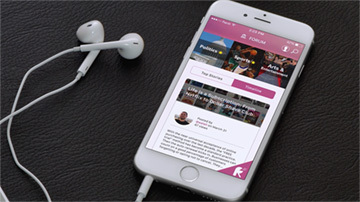 Rantt App creates a new genre of digital media.